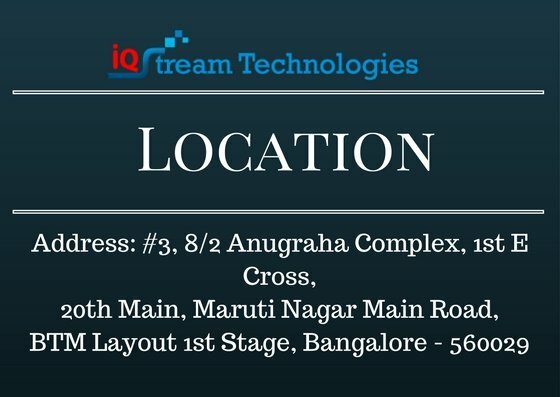 IQ Stream Technologies is one of the top PL/SQL, Oracle training institutes in Bangalore with highly experienced and skilled trainers. IQ Stream Technologies Bangalore also offers placement assistance for students who enrolled in PL/SQL (Procedural Language/Structured Query Language) language for query of Oracle databases developer Courses. PL/SQL is Oracle Corporation's procedural extension for SQL and the Oracle relational database. We offer advanced PL SQL Language classes, advanced learning experiences and tools for better learning, understanding and experience. We offer top quality PLSQL Developer Training in Bangalore with advanced syllabus and highly experienced trainers. PL/SQL is a procedural language designed specifically to embrace SQL statements within its syntax. PL/SQL program units are compiled by the Oracle Database server and stored inside the database. Become and Expert in PL SQL (Procedural Language/Structured Query Language) with IQ Stream Technologies' advanced PL SQL Database Application Development learning programmes. Main highlights of our Training in Bangalore (BTM Layout) include Intensive Practical Training, Advanced Learning Materials & Tools, Friendly Classrooms etc. IQ Stream Technologies offer beginner, intermediate and advanced lessons for you to become an expert in the area. PL/SQL (Procedural Language/Structured Query Language) is Oracle Corporation's procedural extension for SQL and the Oracle relational database. PL/SQL is available in Oracle Database (since version 6 - stored pl/sql procedures/functions/packages/triggers since version 7), TimesTen in-memory database (since version 11.2.1), and IBM DB2 (since version 9.7). Oracle Corporation usually extends PL/SQL functionality with each successive release of the Oracle Database.